FRANKFURT, GermanyAt the Prolight & Sound launch of the new HARMAN Soundcraft Vi7000 digital mixing console, Gigant Sound-Letus of Poland has taken inventory of a Vi7000. Gigant Sound-Letus is one of Poland's top tour sound companies, offering live sound reinforcement for the country's largest concerts and festivals. 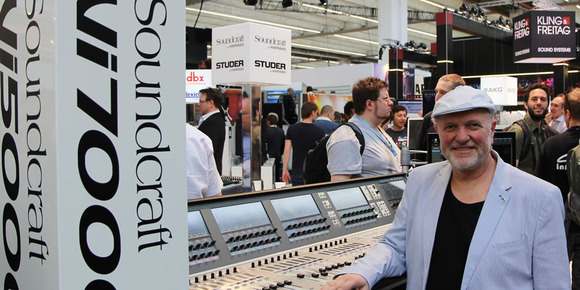 The company purchased the console through ESS Audio, Soundcraft's Poland distributor. Gigant Sound-Letus is a longtime HARMAN supporter, with years of deploying Soundcraft Vi6 digital consoles and JBL VERTEC® line arrays. "I have been a user of the Vi6 consoles, so when I heard about possibility of the new Vi7000, I was immediately interested," said Jerzy Taborowski, owner of Gigant Sound-Letus. The Vi7000 retains the intuitive user interface and pristine sound quality of the Vi6, while adding significant technology and feature set enhancements, including 96kHz processing and upgraded channel counts. In addition, the Vi7000 features the first-ever digital implementation of the classic BSS DPR901ii Dynamic EQ, while effects contain eight independent Lexicon multi-FX units, and a BSS graphic EQ on every bus output. "I appreciate the Vi Series because of its ease of use, rich features and very good sound quality," Taborowski added. "I'm really happy about using the BSS Dynamic EQ and uncovering new configuration possibilities with the Vi7000. Having more channels to mix is a huge advantage." The Vi7000 also offers new local rack and active breakout box hardware, delivering simultaneous mixing of up to 128 inputs and 32 mono/stereo busses with up to 384 inputs and outputs in the I/O system allowing unlimited record feeds from all channels. In addition, the Vi7000 boasts the most configurable local and Stagebox I/O hardware in its class, with extensive ViSi Connect I/O expansion options available (EtherSound™, CobraNet™, Dante™, MADI, etc.) plus a choice of Cat 5e or Optical fibre Stagebox connection to suit budget and cable length. Soundcraft's Global Sales Director, Dom Harter added, "The highly successful Vi4 and Vi6 consoles will continue to be offered for sale an ongoing support in the same manner as the rest of the Vi Series. Additionally, existing customers can benefit from the Vi4/Vi6 upgrade package to a Vi5000/Vi7000 system details are available from local Soundcraft distributors." "The possibility of expanding on the desk thanks to the ViSi Connect options was also a major factor in our decision to add the Vi7000," Taborowski said. "We are looking forward to a very successful future with this console—I expect even more than the legendary Vi6!"